Visit Argyle Feed & Hardware on Saturday, October 7th for a Traeger Grilling Demonstration from 11 am til 2 pm. Argyle Feed Store is hosting a Traeger Chef who will demonstrate the versatility of Traeger Grills by cooking up some tasty treats just in time for lunch! Traeger Grills are built to give you the ultimate all-in-one outdoor cooking experience. Use it as a grill, BBQ, smoker, or a wood-fired convection oven. Join us at this Traeger Grilling Demonstration event and get your very own Traeger. Traeger 6-in-1 versatility allows you to cook hot and fast or low and slow. When you fire up your Traeger, you ignite the power to grill, smoke, bake, roast, braize, and BBQ – you’re the master of all trades. 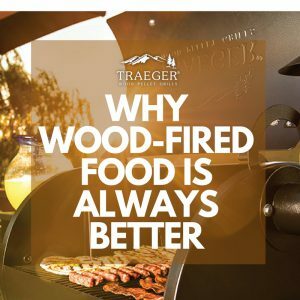 From baby back ribs to wood-fired pizza, smoky mac & cheese, and even homemade apple pie, anything you can cook up in your head, you can cook up on your Traeger. Bring the family and your appetite this Saturday, October 7th to Argyle Feed to find out for yourself just how much better food tastes when fired up on a Traeger Pellet Grill! This entry was posted on Friday, August 11th, 2017 at 7:20 pm	and is filed under Events, News & Updates. You can follow any responses to this entry through the RSS 2.0 feed. Both comments and pings are currently closed.